Ages 6 through 11. Each lesson includes a story and activities relating to a specific place in the community. The short stories relate to situations in the school, library, zoo, and 17 other places in the city. 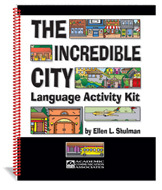 The activities are designed to strengthen association skills, vocabulary, sequencing, and other basic language skills. The kit includes an activity book, game cards, playing pieces, and a full-color game board. All activities are presented in English and Spanish. Use this game with speakers of English, Spanish, or both languages.